President Obama yesterday dealt a fatal blow to the Keystone XL oil pipeline, ending a seven-year review period with a decision hailed by climate activists as critical in global efforts to address climate change. Stating that “America is now a global leader when it comes to taking serious action to fight climate change,” President Obama said that “approving this project would have undercut that global leadership.” The proposed project had been strongly backed by pro-industry Republicans and many Democrats in oil producing states like North Dakota. But environmentalists had sought to block the pipeline. What do you think? Was President Obama’s decision to reject the Keystone XL pipeline project the correct one? What are the environmental implications of this decision? What are the economic implications of the decision? Would you have arrived at the same decision? Why? Government ministers and corporate executives descended on Davos, Switzerland, to meet at the World Economic Forum last week. While the world faces numerous challenges, ranging from the threat of an internet meltdown to the situation in the Middle East, the topic of climate change quickly took center stage. Delegates agreed that climate change posed a major threat to the global economy, with Coca-Cola’s Chief Environmental Officer, Jeff Seabright, noting that “Increased droughts, more unpredictable variability, 100-year floods every two years—we see those events as threats.” Seabright also noted that access to water, sugar cane, sugar beets, citrus juice and other key ingredients was also threatened by climate change. But while the World Economic Forum is noting the importance of addressing climate change, individual governments appear unwilling to make significant strides towards real action. A report in the New York Times last week noted that the European Union is moving to ease climate rules in an effort to alleviate some of the economic pain associated with the global downturn. The United States has refused to sign most international climate change accords, usually citing the threat to the national economy as the reason. Economic growth and a clean environment as thus often cast as rivals in a tradeoff—to get more of one, you have to accept less of the other. But is this accurate? Are environment and economy in constant competition? Al Gore, Bill Gates, and others are hoping not. 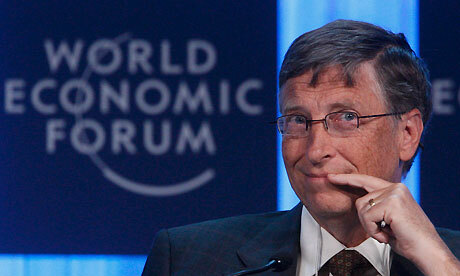 In a conversation on climate change and development at this week’s World Economic Forum, Gates raised the connection between climate change and development, noting that, “As the poorest are being lifted up, as they’re getting lights and refrigerators, we are going to use more energy. There’s not a scenario here where we use less energy. We have to make the energy we use not emit any greenhouse gases, particularly CO2.” But Gore and others are hoping that “clean development” can create jobs and reduce carbon emissions around the world, removing the tension between economy and environment. If they’re right, the future looks a lot brighter. If not, there are some real challenges ahead. 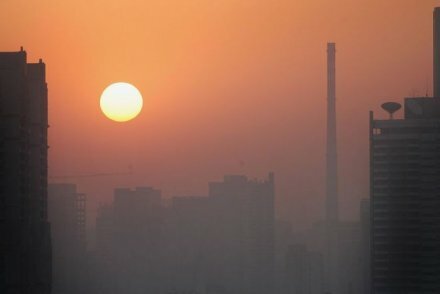 Sunrise over Beijing’s polluted skyline. Air pollution in the Chinese capital Beijing reached levels deemed hazardous to human health over the weekend. According to World Health organization guidelines, air is “unhealthy” when the tiniest particles (PM 2.5) reach 100 micrograms per cubic meter. Individuals are usually warned to remain indoors when they reach 300 micrograms. Unofficial readings from the U.S. embassy recorded levels over more than 800 micrograms per cubic meter. Inhaling such particles can cause respiratory infections and increase the likelihood of developing lung cancer and heart disease. Pollution in Beijing and other Chinese cities is primarily the result of the country’s rapid economic development. In Beijing, air pollution is derived from two primary sources: car exhaust and coal dust. The environmental Kuznets curve helps to make sense of this relationship. According to curve, there is a relationship between environmental quality and economic development. As countries industrialize, environmental degradation (pollution, etc.) tends to increase until the country reaches a particularly level of development, at which point it begins to fall. The theory is that a “clean environment” is a post-material demand. Individuals living in deep poverty place a clean environment relatively low on their list of priorities, which generally focus on more immediate survival concerns. However, once those survival needs are satisfied, individuals begin to demand other rights. This theory has been advanced to explain everything from environmentalism to democratization and minority rights. In the case of the environment, there is clear data that suggest that—for many contaminants—the curve holds true. Interestingly, the tipping point, the level of economic development at which pollution begins to decline, appears to vary by pollutant. Lead, for example, begins to decline at a relatively low level of economic development, while air pollution (particulates) decline at a higher level. For others—most notably carbon dioxide emissions—there appears to be no decline, and levels of CO2 emissions continue to increase in step with the size of the economy at all levels of development. The environmental Kuznets curve raises some interesting questions for sustainable development. If correct (and the theory is itself contested), it suggests that sustainable development is really about transitioning countries from a relatively low point on the curve to a higher point. Once at that higher point, the level of economic development would result in local incentives and demands for a cleaner environment. But the lack of relationship between the level of development and levels of certain pollutants, such as greenhouse gasses, are reason for concern. What do you think? Does China’s economic development raise environmental concerns? How might Chinese development be made greener? Take the poll or leave a comment below and let us know your thoughts. With the 2008 Olympics set to begin in just a few days, I thought it might be interesting to look at the intersection of the Olympics and politics. Over the next few days, I’ll post some special entries on the topic. Stay tuned! For today: China’s Olympic preparations. When China beat out its competitors (Istanbul, Osaka, Paris, and Toronto) to win the host job for the 2008 Olympics, it made a number of promises, including to improve environmental quality to improve its human rights record. Air quality was a particular concern, as some athletes have limited their participation—some are flying in just a day or two before their competition and flying out as soon as they are done—in an effort to avoid breathing the air of one of the world’s most polluted cities. Over the past few weeks, the Chinese government has taken increasingly drastic steps to improve environmental quality in Beijing. It has closed down hundreds of the city’s most polluting factories and taking more than 1 million cars off the road. What impact will this have on the Olympics? China has put a great deal of effort into hosting the Olympics. Successful Games would give a boost to China’s international reputation, confirming its status as a major player on the world stage. Games marred by grey skies filled with pollution would certainly undermine this image. In the end, all the efforts of the Chinese government may actually depend on the weather…if it rains, the skies will clear and the air quality will improve. If not, look for grey skies. The success of the Beijing Olympics—and China’s perceived status on the world stage—now depends on Mother Nature.